Girl In The Woods Reviews: RECAP: Meeting LAUREN OLIVER!!! And from the blog post title, I guess you know who. 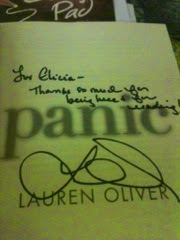 THE AMAZING, BEAUTIFUL AND MAGNIFICENT LAUREN OLIVER !!!! She was the first famous author and undeniably the nicest and warmest person I've ever known! She's so cute and funny and when me and Chloe told her that we interviewed her for our blog, she said that she remembered us!!!! I ALMOST FAINTED RIGHT THEN. I think I may have fallen in love (amor deliria nervosa) with Lauren Oliver (excuse the pun). We also had a Q and A session between the audience and author and the funniest and most memorable question and answer was still this. A: After she ate a banana in ninth grade, she got sick and then puked right in front of her class (which was totally embarrassing). She doesn't like the colour yellow and also the smell. She said she preferred durian (a Malaysian fruit, which is DEFINITELY smellier than a banana) to bananas. 1. Which book did you enjoy writing the most? A: Before I Fall because it was good to relive my life in high school when I was 17 years old again while writing it. 2. Were you scared to become a writer? A: Well, yeah at first. When I got my first paycheck, I quitted all my current jobs and just sat down and relaxed. 3. Did you always plan to become a writer? A: I started writing since I was nine, which was just fanfiction, but I didn't know it was called that then. Writing isn't very fun, but I just loved doing it. She also talked about why she left Requiem (the last book in the Delirium trilogy) as it was. She said she didn't like how some authors liked to control their characters lives, when J.K. Rowling decided to fast forward to when Harry Potter was an adult and had children just because she could. She simply wanted to make the story and its characters play out naturally and the ending was written that way so we could try to imagine the characters' fates and what would happen next. This makes the story more memorable. Also, we found out that Lauren is obsessed with ghosts, which is evident in Liesel & Po and also her upcomping first adult novel, Rooms. And PANIC is going to become a movie!!! Can't wait!!! I know I'm boring you with this lengthy rant so I'll just show some pics now. Chloe had four books signed (The Delirium Trilogy and Panic) and I had two (Before I Fall and Panic). My signed copy of Before I Fall. Love Lauren's loopy signature!!! And finally the beautiful author herself. I've got the feels... From just looking at her beautiful face. We did take a group photo with Lauren but my friends (including Chloe) would kill me if I posted it so I can't post that pic sorry. I'd love to though! Thanks for tuning in! This is something major for us since Lauren is the very first YA author we met face to face and we were crazily fangirling over her. What about you? 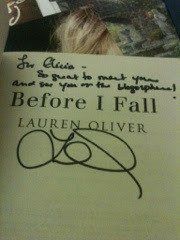 Have you ever met Lauren Oliver or any other author? Also, if you want to read our interview with Lauren Oliver, here's the link to the page! Click HERE.